Although I do realize each team member has their strengths, as the runt in the pack, it is doubtful that anything I have to contribute has much impact on the learning of others in this course. We all have our strengths, as does every student, gaming is not one of mine! I so appreciate the caring and commitment of the #edgamify GiverCraft team because no matter how bad my attitude is, folks have been very supportive and encouraging! The team has a wealth of talent to offer the project and to those willing to learn. This week’s brain expansion spanned from the simple to the complex. Using a list posting format is a method to be tried. Also am gathering other posting format tips for temporal titling so we all know what is what and how to better reference my resources. Lots of authentic assessment methods were mentioned which would evidence learning. As educators, the best evidence that learning has occurred may be observable, but is not necessarily measureable. A team member said it quite plainly: learning has occurred when students can connect what they’re learning to everyday life or to other subjects. On a personal note, having a science teacher son-in-law, am looking forward to sharing the idea of using MCedu to teach about cell biology. Finally, want to re-post a comment made by me on a classmates blog, warned him it was going to happen! *Take as much time as you need to complete the task and move to the next level. If you can’t do it the first time, try again, get better and master. *We have an opportunity to make education function more like a game, not a game function more like education. Better than those who try to treat education as a business! *Complexity without purpose will not be effective. But if done well complexity will foster increased thinking and cognition. How does the philosophy of education should function more like a game compare to the philosophy of education should function like a business? Is this a fair comparison? Is gamification crafting systemic change in education? How about gamification plus MOOCs, are they the catalyst needed for systemic change in education? It is late, and my brain is about flossed out, so these questions could probably have been framed much more coherently. Thanks for the thoughts. Nope, not enjoying Minecraftedu yet. There is a complete lack of joy thinking about playing video games. Perhaps the key word is play. Play is something to do when the work is done…and my work is never done. Therefore, no video game time for this old lady! Guess I would rather be creating something tangible: cooking, sewing, knitting, crocheting, gardening, anything productive. Back in the day in Montana, to obtain an undergraduate education degree, student teachers had to demonstrate proficiency in piano and guitar. I can barely play the radio and it is rarely in tune. Somehow, I managed to plunk out a song or two on piano without too much trouble. The guitar was a whole other story. It was very painful and I was miserable, but I managed to strum a song or two, just enough to qualify as proficient. To this day I hold guitar players in high esteem and my fingers are grateful for never having played a guitar since. I think that is my goal with Minecraftedu: suffer the discomfort long enough to become proficient and then hope my grandchildren don’t invite me to play video games with them! have to stop allowing myself to be distracted by the research because I take off on too many time consuming learning tangents! prediction that gamification will be a permanent fixture in the future of today’s students. I love to play games: card games, board games, sports games, any games. But, I have never played video games, ever! Over twenty-five years ago I was an undergraduate in an instructional media course. Although the paper is not in my possession anymore, I am most certain the assignment was something like: How can we use Oregon Trail to create a sound and robust learning experience for students? Substitute the game Minecraftedu, and voila, we have this week’s #edgamify MOOC task. In an attempt to fit gamification into my schema, my brain started an informal comparison of the two games, old and new. As with the Oregon Trail (MECC, 1988), “simulation application”, Minecraftedu (a sandbox game) has no advertisements, an unusual trait in today’s gaming world. Unlike Oregon Trail (OT), it is not possible to look on or in the Minecraftedu (MCedu) game box to find the instructions for game play. Actually, OT had a fair amount of rules, whereas MCedu basically has no rules. Neither of them have a “leaderboard”. 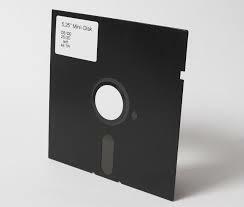 OT, at that time, was a stand-alone game stored on a 5 ¼ inch floppy disk (maybe two disks?). Maybe a couple of kids in the same classroom could work together to survive (the details have faded from my memory). MCedu requires bandwidth which enables it to be played simultaneously with multiple players anywhere in the world. They both are problem solving games. They both challenge players to stay alive by overcoming obstacles to survival. Inevitably, in both games, failure results in death with do-overs to try again for improved performance. 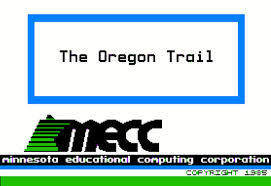 The goal in OT is to reach Oregon alive, because MCedu is an open-ended game, the goal varies with each scenario, but the object is to stay alive. Feedback in both games allows students immediate self-assessment by keeping track of an inventory of supplies and ….. I cannot remember what all else. This is about as deep as my mind delved into the compare/contrast of the old game and the new. Although, I do believe, because of informational technology of this day and age and because of social media, MCedu is experiencing a high degree of popularity that OT did not. OT was more or less just educational software, whereas MCedu is not by any means restricted just to the classroom. Actually, the use and play of MCedu has almost no restrictions for distribution around the world. Oh, I just realized, I think they both use the same antiquated text font! Had a lot of fun composing this, but realized early on it had nothing to do with the assigned task, so tucked it away for another time. Thanks to my colleague Tiffany for inspiring me to actually post this stroll down memory lane. My first foray into the world of blogging was a result of joining a MOOC. Agreed, the blog truly is a way of purging your “brilliant” thoughts and rantings. I spent two hours watching the two Blog Talk videos, and agree they are good, but, because it was my second open class, there was really no new material for me. I am definitely challenged, not by the MOOC, but by Minecraftedu, an activity that “involves uncertain outcomes due to variable levels, hidden information or randomness.” Challenged to the point of incapacitation, am I! I still have no clue what to do, how to do it, and especially have no clue about strategies to use in Minecraftedu. If there was a vocab test right now over Minecraft terms, I most certainly would fail it! Not sure the four principles of intrinsic motivation – control, challenge, curiosity and contextualization – are enough to get me out of the Minecraftedu rut in which I find myself! I am sold on open connected courses, but no verdict yet on Minecraftedu. Maybe I have to know darkness before I can understand light! From the reading the GiverCraft blogs, I also sensed we are not all at the same level of acceptance of the concept, some of us are overwhelmed and a bit frustrated, and others are smooth sailing. One colleague made the analogy to the social learning aspect and collaborative use of technology as being similar to the need for a variety of ingredients tossed into a mixing bowl, working together, to create something good. As a baby boomer, I have a lot to learn from the experienced gamers in our group and am grateful for the knowledge they are sharing. Now for a few good words about the game. Following are some factors of the effectiveness of Minecraftedu (MCedu) for learning. A member of our team emphasized an attribute of Minecraftedu which I have been mulling over: the great potential it has for cultural responsiveness. Can’t you just see a Whaling Activity in Minecraftedu? Gotta love it! One factor is that it allows both students and teachers to be creative. Activating higher order thinking skills with hands on collaborative challenges is certain to be engaging. Other merits of MCedu are that it facilitates the differentiation of instruction and reduces the need to ask the question “Why do I need to know this?” or “When am I ever gonna use this?” Students these days all know how playing video games are going to help them! Another bonus of MCedu is it enables students to be both challenged and successful. Additionally, several of the blogs mentioned the importance of feedback and fun for learning to occur. The game also has the ability for globalizing learning through teamwork, or to borrow a phrase, enables global collaborative tinkering. After reading the blogs of all classmates in this MOOC, Gamification and Open Education, #edgamify, it seems we have a good working definition of gamification. We seem to understand that gamification is the current trend in instruction, that it is a tool for learning, and it not a panacea for education. In general, we feel learning should be fun, and we are all anxious to see our Minecraftedu project’s success, as well as success implementing gamification in our practices. There seems to be a consistent thread of passion for teaching and learning which flows in the veins of the class. It was most interesting to read what video games classmates referred to from their childhood/school days. I still have no video game references in my life. The option of learning from failure in video games is appealing. We do learn from our mistakes. The value gamification places on feedback is very appealing to teachers in this class. Using Minecraft to teach content to ELL students is very appealing. One article I read on the introduction of technology in learning referred to how educators went through the same thing we are now, only it was with radio and how to use it to engage and motivate learners. Again, we all know radio was a trend and is one more teaching tool. My remaining question is how long will the gamification trend last? How has your team approached and documented the design of your game? What have I done since the last meeting? What obstacles have I encountered? According to the author, Karl Kapp, for learning game design, the most effective process is a hybrid approach between ADDIE (Analysis, Design, Development, Implementation, Evaluation), a step-by-step process, and Scrum, a team approach based on an iterative and incremental agile methodology. The first step in the hybrid method is to determine what we want the learning outcome to be, and we have. Because our team is using the pre-existing game, Minecraftedu, the GiverCraft approach is modified from the hybrid method, but a deliberate process has been followed. First we chose the game to use (Minecraftedu) and then brainstormed how to use it to address learning domains to teach the content. Learning objectives were established. A blend between intrinsic and extrinsic motivation was determined. The team determined a storyline, reward system, and in-game activities for the concept to be taught. A rubric for assessment of learning based on the reading Common Core Standards was developed. The team worked on these things to reach a common goal, not necessarily in a sequential order, but all together to advance the project in a flexible manner, not having to wait for someone to finish their part before we start our part. There is an advantage to using Minecraftedu. It has already been tested for playability, engagement, and learning. Although we did not need to create a paper mock up and play it, we did play a sample scenario to create a similar situation to that the students will experience. And, the team has been playing a lot of Minecraftedu, both individually and in groups. The hours spent playing the game provided the team with feedback to help the team improve GiverCraft. Feedback enables us to determine how closely instructional objectives will be met, to give an insight into how teachers might envision using the game, to identify obstacles to using the game, and to test the reward structure established by the team. Taking into consideration the author’s suggestions for the ideal gamification design team and elements of a design document, some of his suggestions were implemented, and some were not applicable. Regarding roles within the team, we seem to be practicing “aces in their places”, letting people do what they do best, because our members have different levels of understanding of Minecraftedu and ability to play the game, as well as different teaching experience. For our project for the gamification of learning and instruction, these roles seem to have evolved: project manager, instructional game designer, subject-matter expert, information tech representative, and representative from the learner population. Although the roles may not be exactly defined or implemented as Kapp does, they are approximately what we are doing. Roles which are basically unnecessary for the team because we are using Minecraftedu are: artist, programmer, music/sound, animator, level designer. There was no need for storyboards and art, but game play challenge scenarios were created. Since this writing is tardy, I know how the game will be presented, documented, and marketed. The game is being presented in Minecraftedu. The group will use a website for marketing, and a weebly for commucication with registered participants. The website, GiverCraft, open to the public, will have an overview of the project, registration forms, and other pertinent information. The private weebly, for registrants only, will be used for keeping track of progress, posting screenshots, and other project sharing. A Google group has been created to address questions and issues from teachers who are participating with their students in our the game. Although we have been collaboratively working on the Minecraftedu challenge project, not all the answers are clear. The design document, to help with planning and resource allocation, is a work in progess. It includes an overview of the concept, statement of the expected learning outcomes, instrucional objectives, game environment, reward structure, look and feel of the game, technical description, and a project timeline. The timeline contains start dates, end dates, estimate of how long each phase will take, and a time for celebrating and sharing. In closing, I want to summarize one of Eric Milks’ Tips for Managing the Gamification Process: gamification should be a balance between fun and pedagogy; keep players interested (fun), yet educate them (pedagogy).1 Ultimately, this is the goal of GiverCraft. Kapp, K. M. (2012). The Gamification of Learning and Instruction : Game-based Methods and Strategies for Training and Education. San Francisco: Pfeiffer. Chapter 9, p. 215. 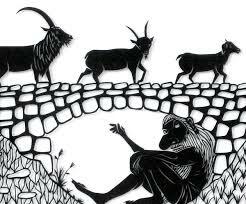 Growing up, I learned about trolls from the story of the Three Billy Goats Gruff. Oh, and those little weird rubbery dolls with the bizarre hair in the 60’s. Oh, and fishing with my gramps from a boat. In the first MOOC, I learned what troll means in the the new millennium. It “originally meant the act of posting a message in a newsgroup (and later on a blog) that is obviously exaggerating something on a particular topic, hoping to trick a newbie into posting a follow-up article that points out the mistake. Traditionally “to troll” means to allure, to fish, to entice, or to bait. Internet trolls are people who fish for other people’s confidence and, once found, exploit it. You have probably heard various opinions about how to deal with people who write insulting or provocative remarks on various Internet forums. 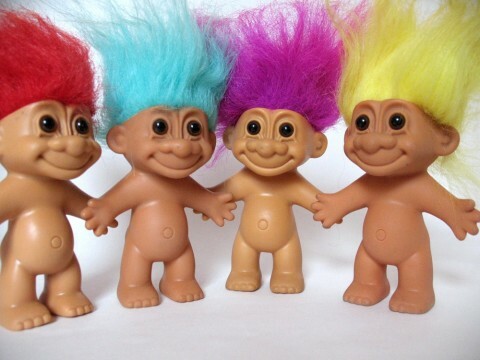 The most common is “Don’t Feed the Trolls”, which says that all the people in the forum should avoid responding to the troll. From Wikipedia “Media attention in recent years has equated trolling with online harassment” or cyberbullying. Griefing is another term new to me. There is a whole page explaining it on the Minecraft Wiki. On that site, griefing is “the act of irritating and angering people in video games through the use of destruction, construction, or social engineering.” Or, deliberately disturbing or destroying other players’ work without their permission. A griefer is a player in a multiplayer video game who deliberately irritates and harasses other players within the game, using aspects of the game in unintended ways. A griefer derives pleasure primarily or exclusively from the act of annoying other users, and as such is a particular nuisance in online gaming communities, since griefers often cannot be deterred by penalties related to in-game goals. From Wikipedia: In Taiwan, griefers are known as “white-eyed”—a metaphor meaning that their eyes have no pupils and so they look without seeing. Behaviors other than griefing which can cause players to be stigmatized as “white-eyed” include cursing, cheating, stealing, and unreasonable killing. Probably the kindest word in my vernacular to sum up a griefer would be idiot. 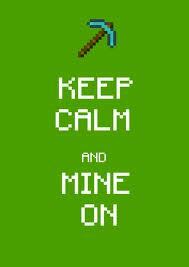 Of which I am one, as a newbie to Minecraft. I have destroyed much, completely unintentionally. So, I apologize in advance for not having the necessary hand-eye coordination necessary to not be a griefer! In my case, the destruction is purely accidental.